Oxalá House intends to follow the guidelines laid down within the Tingitingi® Project, targeting a sustainable tourism. Oxalá (pronounced o-cha-la) is a Portuguese interjection derived from the Arabic ‘Inshallah’, an expression of hope and humility. Brought from East Africa, Tingitingi® is the Swahili word for “footbridge”. This is another word of hope (and modesty, because megalomania would have opted for a bridge instead of a footbridge) in the capacity of fair exchanges between men and women from different cultures to lay the foundations of a world of solidarity. Oxalá House fully follows the charter for Sustainable Tourism, and actively favors direct contact with local people. The residence only works with local communities and local service providers (housekeeping, child minding, tourist guides, sport discoveries, cultural/theme visits…) who are selected not only for the quality of their services, but also for their integrity and effective willingness to find a trade-off between economical viability and development issues. Oxalá House aims to promote a fairer (environmentally/socially) sustainable tourism: tourism based on encounters of equals, benefiting both hosts and guests. Such a mutually beneficial exchange is supposed to allow local communities to value their natural, social and cultural resources without any big threat to their livelihoods, and allow travelers to gain new insights into the visited environment, its cultural diversity and its internal equilibrium forces. 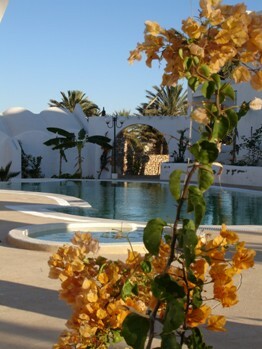 Oxalá House is a charming residence with typical architecture (inspired from traditional « Menzels ») and an unbeatable view on the eastern costs of Jerba Island (Tunisia), carefully integrated within its natural environment of palm trees, prickly pears, aloes and agaves. Oxalá House is located at 700m from one of the nicest beaches of the Djerba island (Tunisia). It is composed of 7 fully/nicely furnished bungalows with cooking facilities and air-conditioning (both cooling and heating), set up around a central swimming pool, and ranging in size from cozy studios (max capacity = 2 pers.) to a spacious three-bedroom cottage (6 to 8 pers.). 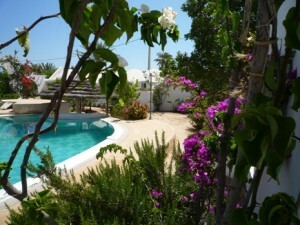 Each bungalow has at least a private terrace with a view on the pool. All our rates are expressed per bungalow and per night (check-in at 2 p.m., check-out at 12 a.m.).Rates depend on season (High season – HS: July / Aug., Middle season – MS: Apr to June + Sep.) and length of stay. Discount rates are offered for extended rentals of 2 months or more. The Booking will be promptly confirmed by e-mail as soon as the required deposit (25% of the rental amount) is paid. A refundable security deposit (100€ for studios, 150€ for 1 and 2 bedroom flats, 200€ for the 3 bedroom cottage) shall be paid on the arrival date. Additional beds could be provided for an extra charge of 7.5€ (LS) – 10€ (MS and HS). Baby beds are available on request. Oxalá House is located on Jerba Island (probably, the dreamy land of Lotos-Eaters of Homer’s Odyssey). It is ideally situated in the area of Mezraya, between the island’s capital Houmt-Souk (8km, best-known for its traditional souk, its fortress and its silversmiths) and the typical village of Midoun (7km). 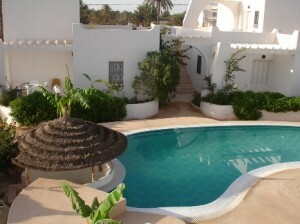 It stands on the tourist road, at only 15km from the international airport of Jerba. Its whiteness will, no doubt, catch your sight just before reaching the Radisson SAS Resort (700m). Please specify the desired capacity and ask about the available services (housekeeping, baby-sitting, car driver…) when making your reservation. Djerba is an island situated off the southern coast of the Tunisian mainland. Its climate is mild. The summer (June to August) is usually hot and dry (75-95°F, 25-35°C). The coldest months are December through February (60-75°F, 15-25°C). Rain is occasional and there will almost never be two successive days when the sun is not shining. Besides its natural assets (beautiful scenery with thousands of palm trees, olive groves, impenetrable hedges of prickly pears enclosing the fields, endless white sandy beaches, 330 sunny days per year), the island offers plenty of social (typical dwellings known as Menzels, lively open air markets, active minorities), and cultural spots (hundreds of fortress like little mosques with characteristic minarets, small epicenter of Jewish culture, theme parks and museums, Ulysse festival in July, pottery and silversmith’s workshops, traditional olive oil press). The numerous historic monuments (Roman ruins, Roman bridge linking the island to Zarzis area, numerous fortresses, El-Ghriba synagogue) testify to the eventful history of this strategic island, coveted by Mediterranean forces from time immemorial. Jerba is one of the few remaining places in Tunisia where a Berber language is still spoken. The island is known for its Ibadite (a school of Islamic belief) and Jewish minorities. Jerba is believed to be the island of the lotus-eaters on which Odysseus landed during his wanderings, as narrated in Homer’s Odyssey. Historical knowledge of the island goes back to the 9th century B.C., when the Phoenicians established trading posts on what was known in antiquity as the island of Meninx. Over the following centuries it came under the control of the Romans, the Vandals, the Byzantines and Arabs (7th century). It was then captured by Normans from Sicily, temporarily ruled by the Spanish and became, at the end of the 15th century, notorious as a pirates’ lair. It was recovered from Spanish by the famous corsair Dragut who laid siege to their fortress (Borj Ghazi Mustapha), whose garrison of 5,000 men were compelled to surrender and were beheaded. Dragut had their skulls built up into a pyramid, which stood outside the fortress for almost 300 years, before being removed in 1848. Borj Ghazi Mustapha in Houmt-Souk: This fortress (mentioned above) was edified in 1289 by Roger de Loria (from Sicily and Aragon), occupied by Spanish and then strengthened by corsair Dragut (in 1557) for protection against Spanish reprisals. Borj Jillij, an 18th-century fortress, located on the coast near the airport. No doubt, you will notice the fishermen at work near the borj, probably setting out with boats piled high with palm leaves which they use to make fishing traps. El-Ghriba Synagogue, a place of pilgrimage for Jews worldwide. Its foundations are thought to be 25 century old. One of the oldest Torahs in existence is located in this synagogue. Jewish people have lived here since 586BC, just after the destruction of King Solomon’s temple in Jerusalem. The traditional olive oil press of Midoun, one of the last well preserved underground presses. Pottery village of Guellala, where some (last few, unfortunately) potters still craft ceramics by hand. Guellala Museum (located on Guellala hill) displays various scenes of traditional life and local architecture. Djerba Explore theme park with its 400-strong crocodile farm (a rather strange attraction) but also its Lalla Hadria Museum (covering a thousand years of art and history) and its traditional Menzel. Hiking (or cycling) through the island, especially around Midoun and Mahboubin villages, to discover the shady gardens of the interior, and orchards of fig, apple and pomegranate. Walking along the sandy (and preserved) beach, in front of the residence. You could wander until the Flamingo Island (8km walk). Jerba is also the gateway to the south. From here you can reach the vast depths of the Sahara Desert, as well as the Libyan desert. Jerba is probably the fabled land of the Lotus-Eaters that seduced Odysseus, as narrated in Homer’s Odyssey. Taggé Djerba, ecotourism, fair tourism, green tourism, Oxala House, sustainable tourism, Tingitingi.